We left home around 9:00 after dropping the truck off to be worked on at ‘Flex a Dent.’ We took our usual route to the coast through Shelton and Raymond. We arrived at Fort Stevens at about 1:00 and set up our tents. Then we went up to the jetty at the mouth of the Columbia and had some snacks on the observation deck. We drove down to Seaside and cruised the main drag. It was packed with people and traffic just crawled. Trend West has really changed this town. After bying some flip flops at a Zumei outlet, we drove down to Canon Beach which was comparatively quiet compared to Seaside. We walked the beach and looked in a few shops, and then drove down to Oswald West State Park, a favorite of ours. It is a remote surfer beach with a campground which can only be accessed by hiking down a trail. Then it was back to Canon Beach and the infamous Mo’s restaurant for deep fried seafood goodies. We ended the night with the most unique fireworks experience we have ever had. 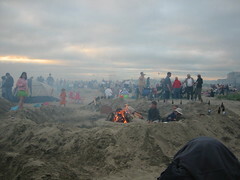 The Seaside beach was packed with thousands of people, many of them families or groups with big pits dug into the ground. Each had a fire pit in the hole and a launch pad for fireworks. As dusk arrived, there began a steady barrage of fireworks from hundreds of launch pads. It was crazy! There were even Roman candle battles. Everybody was lighting off there stock of fireworks. Then at ten, it all subsided as the official town display began. We were right up against the barrier fence, so had a great view of the fireworks. It was just a short trip for us back to Fort Stevens and our broken zippered tents.